It is officially the start of the September 31-Day monthly challenge! I really hope I can keep up this year. I completed the challenge during my first year of blogging and during a time when my RA was at its worst…If I could get through the daily prompts then I can certainly manage them now…Right? Only time will tell! For today’s prompt I decided to ease my way into the month with a simple glitter gradient. I spent the last few days re-arranging, de-cluttering and making sure my nail polish swatches were up to date. In the process I re-discovered a few old favorites! I blame it on the small bottles. When a company manufactures a travel/trial size of their bigger products I never hesitate purchasing the smaller version. It is especially difficult for me to get through polishes so the mini bottles are my best bet! In actuality, this entire look features forgotten polishes: the glitter is from my favorite indie brand and the base is an old Milani…I’ve probably mentioned this multiple times but I do not want to use any of my old Milani polishes! I am less than impressed with the new formulation and I never want to run out of the old ones I have left. Is that weird? Do you do that too? Let me know in the comments! I hope you like my simple nail art today. I have an entire month to build on my techniques and as it is, I probably will focus on RA-friendly looks anyways! Follow me on Bloglovin’. It’s the best way to keep up with me during the challenge! Very cute! I like chunky glitter gradients a lot. Thank you so much!! I agree, they are fast and just look really cool! 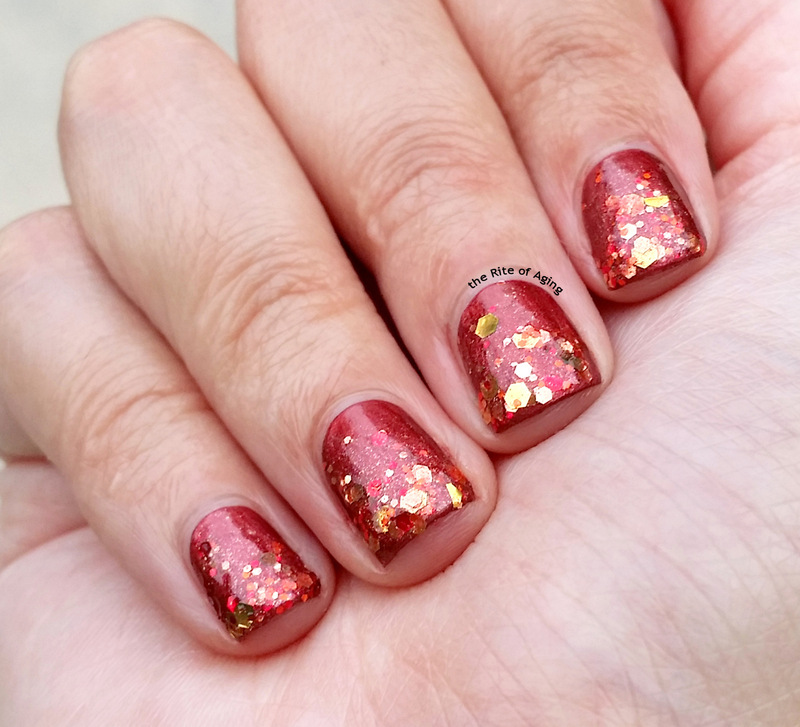 This red combination is so pretty!